Jedi Mouseketeer: Next Quarter, what's next for Disney? Next Quarter, what's next for Disney? News that the entertainment empire is undergoing an internal cost-cutting review could be affecting the stock price, as people with knowledge of the matter told Reuters that one the the results of the review could be layoffs, and speculation indicates the company has some difficult obstacles to overcome. Wait, didn't Profit from last quarter? So to answer the question: yes. Diluted EPS for the quarter grew 17.2 percent year over year to $0.68, while full-year EPS grew 24 percent to $3.13. Revenues for the quarter climbed 3 percent year over year to $10.7 billion, matching the growth rate for full-year revenues, which hit $42.2 billion. 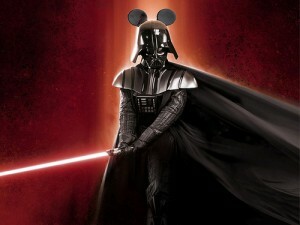 The big news, of course, was Disney’s acquisition of Lucasfilm. Long-term investors (and hopeful but tepid fans) are looking ahead to 2015, when the next installment of the “Star Wars” franchise is expected to be released. Just because the finances are in order doesn’t mean they can be left alone. In its last financial release, the company pointed out that an increase in rates for sports programming has driven up costs. Cable and broadcasting competitors like News Corp (NASDAQ:NWS)(NASDAQ:NWSA) and Time Warner (NYSE:TWX) can sympathize. Each company has been jockeying for a superior position in the increasingly-expensive — but increasingly lucrative — sports broadcasting market. Disney Media Networks revenues for 2012 grew 4 percent to $19.4 billion. With ESPN under its belt, Disney is likely to drive efficiencies in this segment in light of growing competition. Layoffs in 2011 and 2012 at the interactive group and studio, and cuts at its publishing unit last year could foreshadow further restructuring.